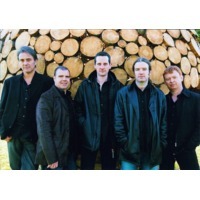 Lúnasa is a traditional Irish music group. Named after Lughnasadh, an ancient Irish harvest festival, Lúnasa was started when Seán Smyth, Trevor Hutchinson, and Donogh Hennessy briefly toured through Scandinavia in 1996. Upon their return to Ireland, they teamed up with Michael McGoldrick and John McSherry to record a few tracks for what would be their first album, which was named after the band. Kevin Crawford joined the group in 1997, and Cillian Vallely followed two years later. In 1999, the group signed a three year contract with Green Linnet Records, and that October released their second album, Otherworld. After releasing The Merry Sisters of Fate and Redwood with the label, they terminated their contract. In 2004, Lúnasa signed up with Compass Records and recorded The Kinnitty Sessions before a live audience in Kinnitty Castle, County Offaly. That same year, Donogh Hennessy left the group. He subsequently recorded an album as a duet with Pauline Scanlon - previously of the Sharon Shannon band - the culmination of a project entitled 'Deora De', an album comprising tunes and songs. He was eventually replaced by Tim Edey and Paul Meehan who each played half the tracks on the album Sé. Tim Edey left shortly after, and Paul Meehan became the band's guitarist. Released in April 2010, the band's newest album, Lá Nua, was the first release on the band's own record label, Lúnasa Records. That same month, the band also performed on the Natalie Merchant album Leave Your Sleep. The group tours for a majority of each year and has performed in the Americas, Europe and Asia.